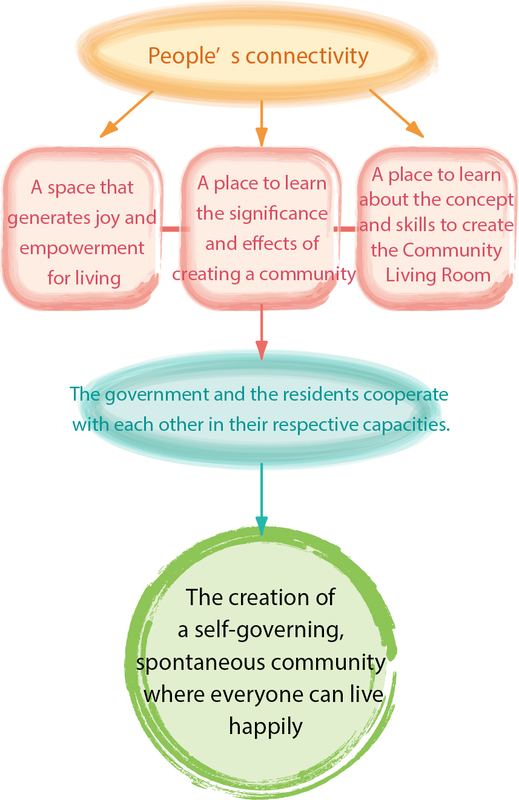 The Living Room School was planned and is operated by Niigata City, the Steering Committee of Parents’ Home Living Room (an unincorporated association), and the Community Center as a cooperative project to provide a short intensive course on the significance and effects of creating a space or a community where people can enjoy life and become empowered to live life meaningfully through the bonds that people form, which is the goal for the Chiiki no Chanoma. Furthermore, it is also a place to learn about the concept and skills that Ms. Kawada has practiced to create the Chiiki no Chanoma. The School did not only mean to create the Chiiki no Chanoma, but also aimed at a happy life for everyone through the combined efforts of the government and the residents in their respective capacities. It also aimed to create a self-governing, spontaneous community. ※ Chiiki no Chanoma: The users of Magokoro Help began to visit and gather in its office. Soon, the office became a place like home for them. So in 1997, Ms. Keiko Kawada officially started the Chiiki no Chanoma Yamafutatsu at the Community Hall of Yamafutatsu, Chuo-ku, Niigata City, her hometown, as a place providing opportunities for people to get to know one another. After that, as the Niigata Prefectural Government decided to disseminate it as the “Niigata Long-term Comprehensive Plan,” the name, “Chiiki no Chanoma,” became very famous and its popularity spread widely. There was no special program and yet it attracted attention as a “place of belonging” where everyone from children to the elderly could spend as much time as they wished, and even regardless of whether they had disabilities or not. It has been spreading all over Japan. ※ My Parents’ Home: Some members of the Chiiki no Chanoma Yamafutatsu said, “Wouldn’t it be nice if we could just stay here instead of going home?” Having heard it, Ms. Kawada rented a vacant house and opened a permanent type of Chiiki no Chanoma  Parents’ Home at Awayama, Higashi-ku, Niigata City in 2003. She ran it for 10 years until 2013. Many people visited it from in and out of the prefecture to observe, and the network of mutual aid spread not only in the local community but all over Japan. ※ Shichiku  Parents’ Home Living Room: It was designated as a model project to showcase an integrated community care system that Niigata City worked on. Shichiku was opened in October 2014 as a collaborative project of Niigata City and the Steering Committee of Parents’ Home Living Room (an unincorporated association). They utilized a vacant house in Higashi-ku, Niigata City. It was a reproduction of My Parents’ Home. Not only the elderly but people from all generations were invited as users as it was set up as a model in an effort to establish a new structure of mutual support in the local community.